These are things that we, as human beings, try to avoid, when all the while, they, ironically, cling to us, because of how much we fear avoiding them. In this age of technology, sanitation, and pinpoint accuracy, we’re constantly living on a tightrope wire, and one step means death, even when we’ve never practiced walking on a tightrope in the first place. The young and inexperienced are unnecessarily hard on themselves. But here’s the thing. What we need to realize is that we are running away from the very thing that we need: experience. Of all kinds, not just the good. We like the good experiences, obviously, because they make us feel good, and we want to keep that feeling going. We don’t want to see the ugly or the bad. But in learning something new, the bad and the beautiful are bosom buddies. It’s unrealistic for anyone to get something right the first time they try to do it. …Well, actually, let me rephrase that. It’s unlikely for someone to get something right the first time they do it. It’s possible, but not probable. You can ask a five-year-old to write an essay, but if he’s never heard of a thesis, an introduction, a conclusion, a paragraph, quotes, and so on and so forth, what can you expect? Nothing good will come of it if you expect too much. 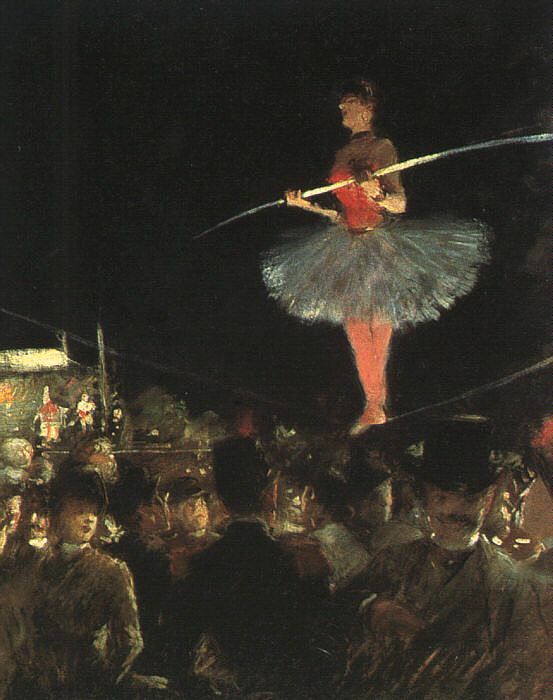 This is why tightrope walkers take baby steps when learning. They practice on parking lot curbs. Small walls. Slack lines tied to trees. They gradually build up their understanding of the action at hand. And if they do fall off the line, they’ve got grass to catch them. They’re allowed to make mistakes. They’ve got that cushion. It’s the same idea in writing. You need to learn the alphabet before you can write a word. A sentence. A paragraph. A page. A scene. A chapter. A flashback about a certain character. A setting to place the story in. A clearly articulated conflict. A novel. And that’s a good thing, because you moment you realize what you’ve done wrong, you’ll remember not to do it again. And when you do something right, you’ll remember to keep doing it, because you’re that much closer to learning how to walk on a tightrope, or ride a bike, or write a novel properly. You won’t know unless you try, and that’s scary for some people. They don’t want to go to page 34 in the Choose Your Own Adventure book, because the last time they went down a corridor, they got attacked by a dragon at random. Or, they have a suspicion they might be even if there was no dragon in the first place. And that’s okay. Fear of trying something is good. That aching feeling in your gut? The sweat in your palms? That’s just your body’s way of giving you energy in case something does go wrong. And if you just don’t want to do something, you don’t have to. No one will judge you for it, or should. And if they do, they’re not your friend. However, when you let that fear overcome you instead of using it to help you, that’s when things get hairy. And when you think about it deeply, it rings true most of the time. Even machines fail, or start to break down. Even those who’ve been driving a car for years make mistakes: forgetting their headlights aren’t turned on, not replacing the stickers on the license plate, forgetting their driver’s license. Even masters of writing, thinking they have no mistakes on their manuscript, read it aloud and find a typo that they weren’t aware of while typing. Or they get tired, and more mistakes fall under their radar. Being infallible is being inhuman. And, just for clarity, this isn’t to say that everyone should make mistakes on purpose. Then it’s not really a mistake anymore. But if you try something and make a mistake that you didn’t mean to make, that’s fine. Mistakes are like that. They are spontaneous and arise from blind spots within your mind that you didn’t previously shed a light on. [I]f you are making mistakes, then you are making new things, trying new things, learning, living, pushing yourself, changing yourself, changing your world. You’re doing things you’ve never done before, and more importantly, you’re Doing Something. What happens when you don’t do something? I don’t know what death feels like. I’ve never been dead or close to dying. And I don’t think I will be for a long time. However, I think I have a pretty good idea of what dying on the inside might feel like. And when I say this, I mean that this is my guess. I am not saying that I understand the struggles of those who are actually dying or have terminal illnesses and what have you. Anyway, one day, in high school, I was sick with some kind of flu. I was so sick I couldn’t hear straight. I was listening to music, and the song I was listening to had somehow reached my ear at a pitch lower than it should have been. The flu zapped the energy out of me, and all I could do was take a nap. At that point, I was just overwhelmed with fatigue and confusion. Nothing felt right. And while this is a physiological/immunological experience, stress and depression become that sort of overwhelming force that takes you in and doesn’t let you go. That’s fear. That’s the death of you. When your own mind and body try to swallow you whole in a sort of self-mutilation. It lingers. Not for minutes, but for days. Weeks. Months. Years. But only if you let it. And when you publish it, let it go. Move on to your next book. Do something else, and make more mistakes. Try new things. See what works and what doesn’t work. Just as there are rules about grammar and how you figure them out when you break them, you have to figure out what works and what doesn’t work for you, kind of like how you learn a language. When I was first learning Japanese, I was very quick. I had an enthusiasm for the language very early on. Now, as I pursue the minor, some of the things we’re discussing are more complex. As a result, I’m making more mistakes. The same goes with my writing classes. For the longest time, I’ve been a pretty good writer. Now that I’m in college, my professors and peers expect more of me. Sometimes, the pressure gets to me. But the biggest mistake I made was telling myself that mistakes were the end of the world. That just because I didn’t do that well on one Japanese chapter test, I’d surely have a poor grade in the class. That just because I was given a very burning critique on a story of mine, that I wouldn’t be able to learn how to write good stories by the time I published them. That was my mistake: letting my failure eat away at me and make me worry and make me feel angry at myself for not doing as well as I was before. That has to change. If I don’t understand something, I’ll ask. If I have a bad habit of not proofreading my work, I’ll proofread it. Point being, I’m learning from my mistakes doing something about it. Because mistakes have a funny way of showing up. When you try to barricade the door with thoughts of, “I’ve got to be perfect,” they burst open the door easily, leaving a mess of your mind like bad roommates throwing a party in your room. But when you welcome mistakes, when you learn why they came, you start to find ways to keep them away in the future. You gain control over the situation. That’s what mistakes are for.